Review: Alex (Lion), Marty (Zebra), Melman (Giraffe) and Gloria (Hippo) escape from New York Central Zoo assisted by four penguins. They soon find themselves in Madagascar. Funny animation comedy. A film that is suitable for all ages. 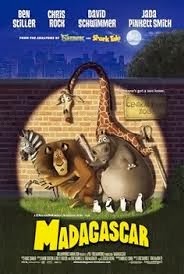 The main animals in this film are not actually housed at the zoo. There are only the penguins.